Autism Spectrum Disorder (ASD) is a pervasive developmental disorder, which affects all aspects of a child’s development. Children with ASD have impairment in social relationships, communication, restricted/repetitive interests and impaired imagination skills. In conjunction with this children may have significant motor and sensory difficulties. The problems children with ASD experience are likely to continue through adulthood. No two children with ASD are the same, as symptoms and behaviours vary from child to child. Symptoms also vary from mild to severe. What is the cause of Autism Spectrum Disorder? At present there is no single, known cause for Autism. Most experts agree that Autism Spectrum Disorder is the result of a number of different factors that affect the developing brain. It has been well established that in some cases there is a genetic component associated with the disorder. What are some red flags of Autism Spectrum Disorder? NB:// Not all children who have autism will present with all of these red flags. Unable to understand that an object can be used for another purpose (for example in play a child does not understand that a paddle pop stick may be used as spoon). Shows intense level of interest in one area (e.g. can appear to be obsessed with something such as Thomas the Tank Engine). Is it true? Are children with ASD visual learners? Children with autism spectrum disorder are primarily visual learners and this should be taken into consideration when trying to teach or explain something to a child with autism. Children with autism are described as being 90% visual learners and 10% auditory learners. The use of visual strategies are strongly recommended to improve communication, help improve behaviour, facilitate learning and to develop independence skills. Can you help me understand the spectrum that is AUTISM! 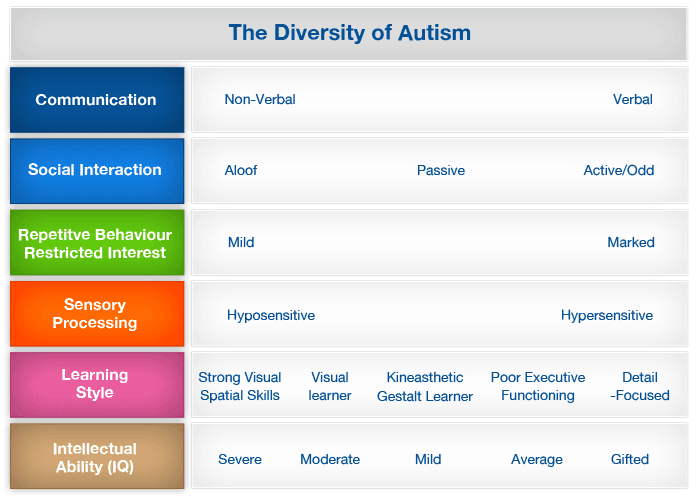 This table was developed and created by the Australian Autism Education and Training Consortium, Autism Spectrum Australia, University of Canberra, Autism SA and Department of Education and Training WA. Some useful fact sheets about autism can be obtained from Positive Partnerships. - Quill, K. (1995) Teaching Children with Autism: Strategies to enhance communication and socialisation. Delmar: Cengage Learning. - Australian Autism Education and Training Consortium. (2010) Parents and schools in positive partnerships.